Location: 40 Jull Street, Armadale, W.A. Just perfect for couples or if you dont mind sharing with up to 2 young children. The reverse cycle air conditioned “Pool Suite” has an ensuite bathroom (shower, vanity & wc) and kitchenette (with microwave, electric 2 hob oven and all the cooking equipment you could need). With a Queen bed, Sofa bed and a delightful poolside covered patio with electric barbeque, there’s room to relax and enjoy the “home away from home” atmosphere so often praised in our guest book. There’s even a dedicated direct phone line and local calls are included in the price. The room is freshly furnished and fastidiously maintained. The Pool Suite enjoys a covered patio, 6 seat patio setting and electric BBQ by the pool. Our fully self contained “Cottage” accommodation has a dedicated direct phone line and local calls are included in the price. The reverse cycle air conditioned 2 bedroom “Cottage” enjoys spacious open living with lofty cathedral ceiling and a fully equipped kitchen. The large open plan living area of the cottage is beautifully furnished and the 2 large sofas (one is a sofa bed) will seat 7 whilst the dining table seats 6 in a spacious area separated from the living area by a short wall. The Queen Room of the Cottage has a queen size bed, large inbuilt mirror robes, ceiling fan, bedside lights, alarm clock and dressing table with a stool. 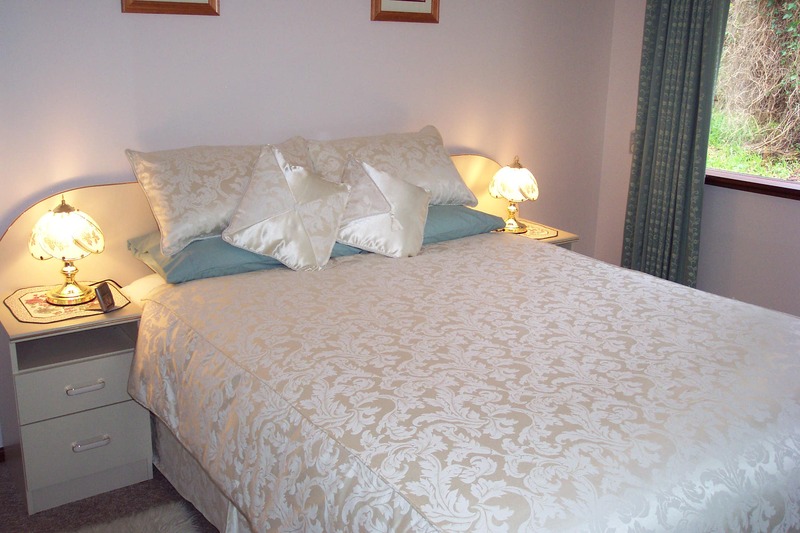 The Twin Room of the cottage has 2 single beds, a ceiling fan, bedside lights, alarm clock and large inbuilt mirror robe. A joint bathroom/laundry/wc is equipped with a shower, vanity, heater light, washing machine and laundry cabinet making it perfect for bigger families and longer stays. The Cottage enjoys a Shade Sail covered poolside patio with 8 seat setting, private electric BBQ and delightful view of the garden. The Cottage has TV and video with a selection of videos at no extra charge looks out over a superb in-ground pool and patio with heated (by arrangement) outdoor spa to enjoy. Cereals, Eggs, Butter, Milk, Orange juice, Yoghourt, Fresh Fruit, Jam, Marmalade, Peanut butter, Vegemite, Toasting Bread, Raisin Bread, Crumpets, Muffins and Pikelets. Fitness fanatics have the free use of our mini-gym with electric walker, cycling machine, stepper, exercise ball, rower and absculpture devices at their disposal and at their own risk although children are not permitted to use this facility unless with direct adult supervision. No smoking is permitted in either facility but smokers may smoke outdoors. If cancellation is made less than 7 days prior to the reservation a penalty of 1 night’s accommodation per room reserved applies.